WYSIWYG stands for What You See Is What You Get. Many websites are maintained by creating files using HTML (HyperText Markup Language) and transferring the file to the server using FTP (File Transfer Protocol). 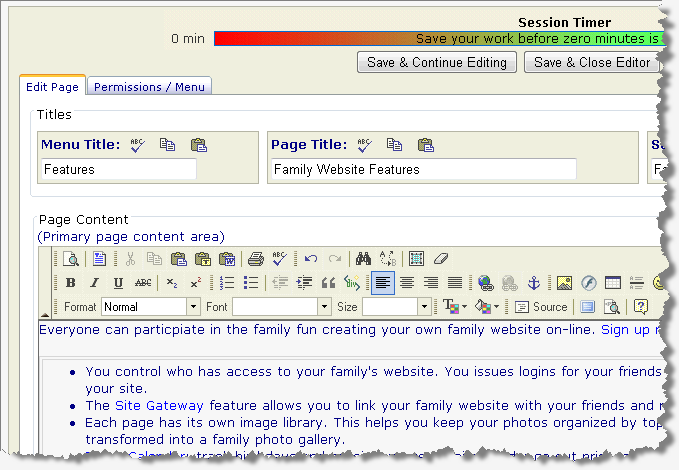 Your family website has all tools you need built in so there is no need to learn how HTML or FTP, just logon, click Edit Page and the Editor opens in your web browser. The screen shot below shows the editor, if you can use a word processor like Microsoft Word, You Can Do This. If you get stuck help is only a click away. Instructional video buttons (shown to the left) are located on task related pages through out the site. Click the Instructor button if you would like to take it for a test drive.